Which is the disaster: Earthquake or Internet disruption? I found this quite amusing. As you know, there was an earthquake just off the southern coast of Taiwan a couple of days ago. This one is not a tiny burp – but a huge 7.1 Richter scale monster. Instead of talking about the devastation that is surely affecting the island, I noticed that most of us are really more concerned about the fact that our internet connections are affected by the damage to the underlying communication cables. This is startling to me in two different ways: how incredibly different our lives have been changed by technology and the Internet, and if this is a signal of our growing apathy towards happenings in our world that doesn’t directly affect our immediate lives. Another weekend, another warehouse booksale. This time, the haul is decidedly less genre-based due to the items on offer, and the bookstore chain that’s having the sale, but still, not too much to complain about. Well, actually, So That’s What They’re For! was actually bought a couple of days ago, but I threw it into the pile anyway. 1. When your wife is pregnant, your book haul will invariably be a little more diverse. It’s not all dragons and monsters, anymore! 2. I’m buying way too many books. I notice I said this before. Many times. 3. You have to get to warehouse sales early. I mean on the early hours after opening on the first day of the sale. Reason is simple: the chances of good books staying on the shelves will dwindle the longer it takes for you to get there. Sure they open up new boxes as the days go by, but really, isn’t it a gamble to wait? You don’t even know when they are going to open it! 4. I just realized that point 3 above is the talk of a crazy person. Another recent haul… I’ve uploaded what I thought about Masters of Doom in the previous post. I was pleasantly surprised I was able to get my grubby hands on Chuck. Fight Club, no less. I hadn’t watched the film, but my money’s on the book being better. In a frenzied 2 day book marathon, the most book-reading I’ve done in a two day period in recent memory, is about the lives of the founders of my most admired software games development company out there, id Software. 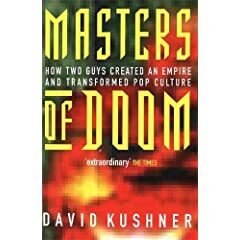 The book Masters of Doom follows the lives of the two main founders of id, leading up to their development of arguably the best game ever, DOOM, and the events that followed after that. It was a utterly interesting read – I read about what the development of some of my favourite games was like, the infighting that occurred, the motivation and what drove them both apart. I was very much a part of the scene as it unfolded in an online internet drama – I followed the happenings myself in the events that was described in the second half of the book, so it was interesting to supplement my understanding of the situation with the documented events in the book. id remains the most impressive games development company for me, and John Carmack remains my most admired technologist. Reading this book made me relate to them all the more, because although I don’t drive a Ferrari, write shareware, have pretty chicks around me or have long hair, we share something in common and that’s a love of games and the feeling of excitement in that early part of growing up. Carmack’s ability to push the technical envelope, his pioneering ways and his bullish attitude is admirable, and inspiring.